Brantford – Wilfrid Laurier University and the City of Brantford officially celebrated the grand opening of CityStudio Brantford on March 28. CityStudio is an innovation hub where students, City staff and community stakeholders tackle municipal issues and co-create solutions that support the City’s strategic priorities. CityStudio projects have been officially underway since Brantford City Council endorsed the partnership in November of 2015. This event provided both a grand opening for the dedicated CityStudio space in Laurier’s Market Darling Centre, and an opportunity for CityStudio participants to showcase some of their work. The program connects City staff, students and faculty with the community in the creation of experimental projects. “The overall goal is to make communities more liveable, sustainable and socially prosperous while also providing students with opportunities to develop their skills while making meaningful contributions to their community,” said LeClair. Among the CityStudio initiatives showcased at the event were a program that prevents litter and recycles cigarette butts into packaging material; a lead pipe awareness campaign; a study of social participation of older adults living in city-run retirement buildings; and the “Hawk Walk,” a proposal for a signed walking route intended to promote physical activity among students and downtown residents. 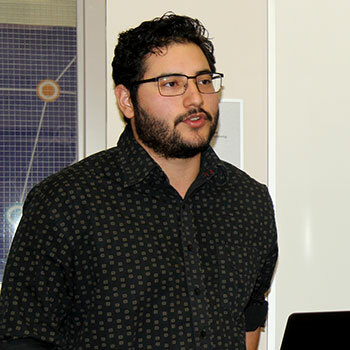 All projects are led by Laurier students, and one recent alumnus of the Brantford campus, with advice and guidance from faculty and experienced municipal staff. The successful collaboration between Laurier and the City of Brantford has resulted in the development of a fourth-year community development course where City staff work closely with students on project design and implementation, while students gain practical experience working within a municipal setting. CityStudio provides an experiential learning opportunity where students and faculty connect with City of Brantford staff to research, design and implement projects while developing job skills, experiencing group processes and networking with municipal sector experts. The new CityStudio space was outfitted with computers, workstations and other resources thanks to support from the Student Life Levy Fund, and the Brantford Campus Grants Program. Brantford is one of seven cities worldwide to implement a CityStudio partnership. Other communities include Waterloo, Ont., where Laurier is also a partner, Victoria, BC; Abbotsford, BC; Corner Brook, Nfld. ; and the Australian cities of Logan and Bendigo.